Cloud connectivity - secure and resilient cloud access - Exponential-e Ltd.
Our Cloud Connect (Exchange) service enables customers to connect with their chosen Cloud Service Provider (CSP), creating a secure and resilient connection that effectively extends your WAN in to the Virtual Network at the CSP - all through our secure and private Network. Our team can also fully handle all routing of your Cloud Connect service should you require it to be delivered directly in to your WAN. Secure and resilient Network access is an essential component of Cloud Computing. A dedicated private connection to your Cloud assets reduces Network costs, increases bandwidth throughput and improves Network performance. 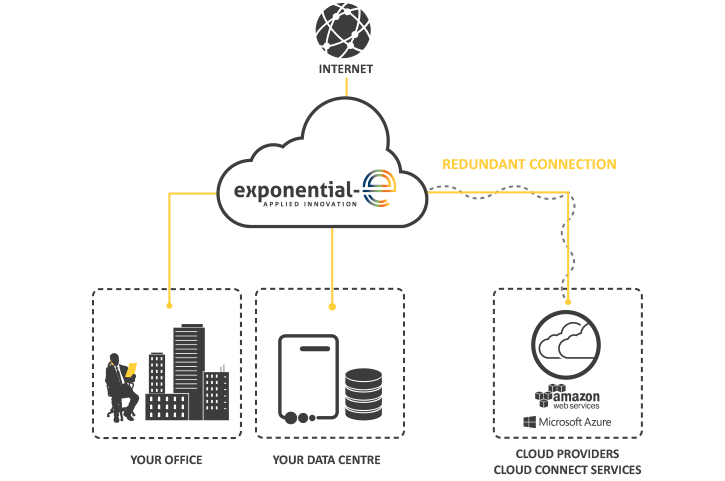 Our Cloud Connect service provides a dedicated Network connection from your premises to third party CSPs including Amazon Web Services (AWS), Microsoft Azure and Office 365 via Express Route. By using our Cloud Connect service you can establish private connectivity between your current CSP and data centre, office, or co-location environment. Our Cloud Connect solution is fully redundant by design, meaning you don't need to worry about expensive extras to provide the reliability and peace of mind your business needs. Our private dedicated Connectivity bypasses the public Internet, providing predictable latency and high performance access - from your premises or Data Centre, right to your Cloud Environment. Connect to AWS, Microsoft Azure and Office 365 via Express Route. Dedicated bandwidth and predictable low latency. Connect centrally via your VPLS WAN or from a Dedicated Site. Take dedicated EVCs to dedicated Clouds over the same physical Connection. Choose from a range of bandwidths to suit the needs of your business - up to 1Gb. Mesh your selected CSPs by selecting dedicated EVCs between them. Fully redundant Connections by design. Fast, efficient and reliable service delivery backed by stringent SLA’s. Significant quality end user experience. Flexible service to scale in line with your business needs. Seamless user experience without interruption to the CSP of choice. Reassurance that the traffic the user is sending is safe and not subject to the vagaries of the Internet. Cost savings - no need to take additional back up options. You are in control - we deliver CSP Connectivity to your sites in a format dictated by you.